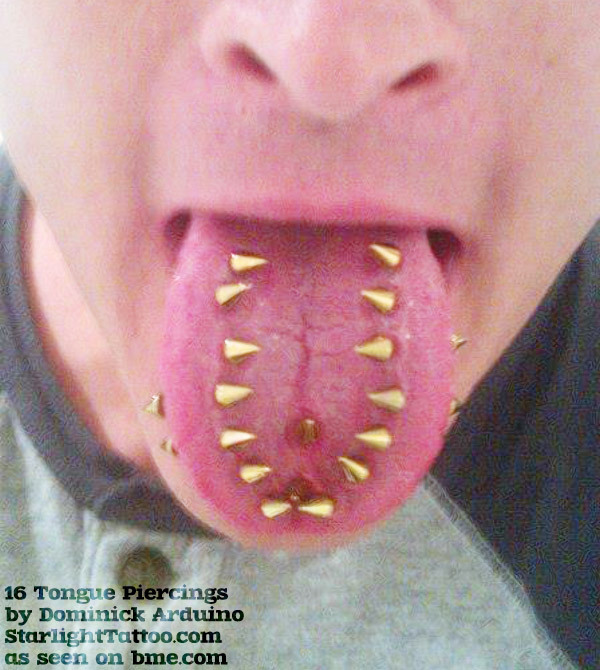 13 Tongue piercings… and climbing! I don’t think thirteen is a world record, but I wouldn’t be surprised if there are less people with ten or more tongue piercings in America than there are States in the Union (although that’s a bad metaphor as she hails from Leighton Buzzard, England) — Heather’s piercings are much, much more unique than I’d given her credit for. I asked her to tell me a little more about them, and she tells me that initially her plan was to get six of them, in a cross shape, but by the time she hit that goal she was totally addicted and now the design motif is something closer to “where will they fit?” The piercings are all done in 14ga, and as she’s gotten more of them she’s had to start putting smaller beads on the bottom to keep it all comfortable. Her first six or so tongue piercings were done by “varying artists” that she “barely remembers”, the next few by Blue Jigsaw, and since then — the most recent four — are self done. I asked her if her speech or anything else is affected by having so many, and besides the healing period (“and sometimes not even then”), the answer is no. In addition to the twelve vertical bars, Heather also has a rare horizontal tongue piercing, done about ten years ago by Mark Stubbings — it actually took her a year to find him after first seeing horizontal tongue piercings on BME and deciding she had to have one. That said, of all the piercings she says the horizontal was the most trouble, including biting through the PTFE bar that she initially wore in it — but it settled down and it’s still there, making this project all the more unique. As to how far she’ll take it? There’s no upper limit, so she says it’s really just a matter of how many seeing how many she can fit without it starting to majorly affect eating or speaking! In addition to the picture below (which she adds looks a little off because some of the bars are longer than they need to be), you can see videos of her 6th tongue piercing, her 7th and 8th tongue piercing, as well as her 9th tongue piercing on YouTube. EDIT/UPDATE: Dominick Arduino, piercer at Starlight Tattoo (starlighttattoo.com) in New Jersey just topped Heather with this photo of one of his customers (who you may recognize from the BME galleries due to the distinctive jewelry — and remember, they can key your car with their tongue if you say anything bad!). This photo, taken last year, shows it with sixteen piercings — sixteen spikes capable of turning fantasies into nightmares — but since then they have added two more (and I am sure will do more after that). I’ll update with a more recent photo when I am able. This entry was posted in ModBlog and tagged Tongue Piercing by Shannon Larratt. Bookmark the permalink. Probably good for giving head, but my god I wouldn’t ever want to heal my tongue that many times! Some say that a tongue piercing hurts more than splitting a tongue, and piercings take months to heal, vs a few weeks for the split. One of my customers hold the world record for most tongue piercings. I did 16 on him and is in guiness 2013. We just added 2 more last week for a total of 18. I’ve never had my tongue split, but I have had it pierced a couple of times. Personally I don’t think it was noteworthy painful at all, and it healed completely in a week or so. - Piercings in the mouth generally heal quickly. And mine in general even more so, but still. That is a lot of piercings in one fairly small piece of fresh. It has got to be a bit awkward having so many piercings in the mouth. But, I am sure that is something you eventually get used to as well. Dominick’s customer definitely has the cleaner looking assortment. Also looks like his healed better then Heather’s as well. Didn’t Angi Cook have an awful lot of piercings as well? I’d love to see some pictures of their teeth and if it’s caused damage and how much! much less chewing work to be done? dont them hurt you specially on the lower jaw inside? I bet her breath smells lovely. Well. I have 5, three down plus the vipers. think of a plus sign. really want to get more. think this might be fodder to get them. does it not give pain on the palate when chewing ? I totally get what heather is saying. At first I decided that I would only want a horizontal piercing. That didnt last long and just over a month later I got my first vertical tongue piercing. I was totally hooked on them by then. Fast forward a few months and I ended up getting two more vertical piercings with a friend. I actually didnt plan to get them then. But just seeing my friend getting her tongue pierced got me the urge again. So I told my piercer that she could stick a few more in my tongue too. Beginning of december last year I got a second horizontal tongue piercing. And tomorrow I’m going back to my piercer to get two more vertical done.